When it comes to choosing timber flooring for your home or project, consider engineered timber instead of solid hardwood. Engineered timber flooring offers several advantages over solid timber flooring, by providing a more environmentally-sensitive material as well as by standing up to the harsh Australian environment. For instance, an engineered timber floor uses about 33% or one-third of the amount of solid hardwood sourced, compared to solid timber floors. Only the top surface layer – the wear layer – is manufactured from solid hardwood timber. In comparison, solid timber flooring is completely composed of 100% hardwood; consequently, the lower 66% or two-thirds of the timber component is practically wasted. This area will never be seen as it is located below the tongue and groove, making it a wasted resource. An engineered timber floor with its cross-ply strength is more adaptable to the harsh Australian environment, offering greater stability regardless of seasonal changes or conditions. Engineered flooring products from Nufloors Australia are manufactured using non-controversial hardwood plywood carefully sourced from hardwood timber plantations grown specifically for the purpose. Sufficient care is taken to ensure that the timber species being harvested is not rare or endangered. 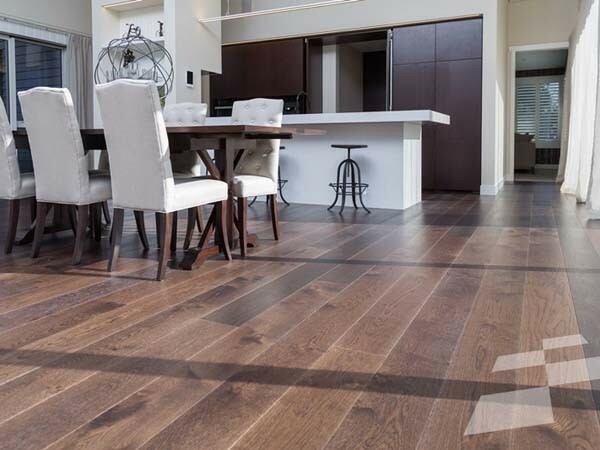 Most of the flooring products available from Nufloors feature veneers made of European Oak, which remains a non-controversial and renewable species. Nufloors’ Manor Collection range comes with a PEFC certification (Programme for the Endorsement of Forest Certification). Nufloors’ engineered timber flooring ranges also include Smart Floor, Ultra Floor and Pro-Plank, and can also be supplied with an FSC certification. Nufloors’ engineered flooring products comply with CE certification as well as relevant European Environmental and Emissions Standards.